A ground plane for a CB radio antenna is the metal surface needed below the antenna. In mobile applications, the vehicle body acts as the ground plane (reflective unit). The metal surface enables the signal generated when transmitting to reflect off the surface and travel into the atmosphere. An antenna ground plane is not to be confused with an electrical ground. A typical mobile CB antenna does not transmit horizontally, it radiates in a downward pattern. A metal surface (the larger and flatter, the better) is required underneath the CB antenna to launch the signal out into the atmosphere. Without an adequate ground plane surface, the signal will not travel out into the atmosphere which results in limited transmission range. Damage to your CB radio may also occur if you do not have a proper ground plane because this generally causes a high SWR and the signal may back feed into the transceiver, causing internal harm to your radio. A no ground plane CB Antenna is a CB antenna that doesn’t need a ground plane (large metal surface under it) to run. Ground Plane antennas are specially designed to operate on fiberglass vehicles and boats. A No Ground Plane antenna installed on a vehicle or boat constructed of metal will not operate accurately. In most cases, you will not be able to tune the antenna which will result in a high SWR that could harm your radio. A no ground plane antenna is designed to use the ground or water to transmit horizontally. 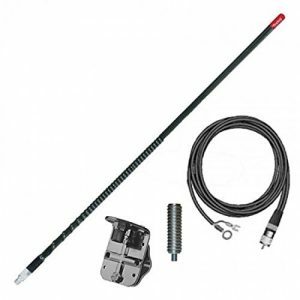 A No Ground Plane antenna will not perform as well as a traditional CB antenna of the same length, but in situations where you do not have an adequate ground plane such as on a boat, RV or motorcycle, they do the trick. Make sure to read the instructions thoroughly before installing the antenna. You can use Firestik FG4648 as no ground plane CB antenna. It is specifically designed to solve the problems associated with the lack of ground plane. Ground plane problems typically show up in the form of high standing wave ratio (SWR) and poor performance. The isolated ground plane that is built into the FGX-648 series kits can also eliminate problems on metal base vehicles that lack the sufficient ground plane for proper operation. There are several devices available that can enhance your ground plane. This is accomplished by normally adding a 3 point radial to the bottom of the antenna. Ground Plane enhancers are not designed to be the sole ground plane for an antenna, they just help achieve a better ground surface.